Our remote light heads will direct light exactly where you need it in your facility, as well. For added security in case you lose electricity, choose an exit sign and light with a backup battery. Select your safety equipment from labels with glow in the dark letters, adjustable light heads, weatherproof light heads, and LED lighting units. These signs and lights will guarantee your customers can find your exits and see their way around your business. Also make sure to check out other great items from Lavex Industrial, Buckeye and Lithonia. Safety is a serious concern for any restaurant, hotel, school, or healthcare facility. That's why we offer a wide range of exit lights and signs for the safety of your staff and customers at your restaurant, store, or other business. 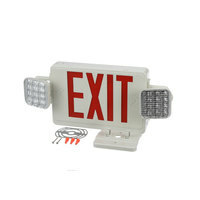 Choose from exit signs, lights, and combination units. We even carry remote light head options as well as glow in the dark adhesive signs. Features like backup battery power also ensure that these units stay operating in the event of power outages. Be sure to check out our helpful safety supplies, including our fire extinguishers, restaurant compliance signs, and parking signs. If you're wondering where to buy lithonia emergency lights and exit signs, we have a large selection of lithonia emergency lights and exit signs for sale at the lowest prices.